2 years ago, when I posted the uDida appe recipe, I promised I would post this version with kabba(sugarcane) rosu(juice). But one or the other thing kept me posting this. I can’t believe it took me so long. PaDDu(Kannada), appe(Konkani), ponganalu (Telugu), paniyaram(Tamil), unniyappam(Malayalam), is one of my all time favorite breakfasts. While growing up, these sugarcane versions were prepared only during season when someone who grew them gave the juice to us. These are grown only in few fields and the juice is used to make sugar. Two things which were staple when we got the juice was this one and a special chakli. We also liked to drink the juice spiced with ginger, lime juice and green chilies. Luckily we have an Indian grocery store nearby which serves fresh sugarcane juice. They usually spice it up, but I always take pure juice to make this appe. My parents brought a nice feather-weight appe kayli(the pan in which these are made) and I have been making these or the other simple appe very frequently. I love these non stick pans because I use only a drop of oil in them (for taste). These can be taken out from the nonstick pan so easily. I also love the aluminum version that I had in India. Traditionally cast iron pan is used and people say the appe made in the cast iron pan tastes great compared to those prepared in any other kind of pans. I never felt any change in taste so far. I don’t prefer the cast iron pan because the batter sticks to the pan and to avoid sticking, we need to add a lot of oil. I have seen aayi struggling with such pan, she now uses the aluminum version, which gives superb results. So if you can find, buy the aluminum pan which has same thickness as cast iron one..
Sugarcane juice and jaggery needs to be adjusted according to taste and consistency.Ghee taste better than oil since these are sweet. Soak rice and fenugreek seeds for about 4-5hrs. Soak the poha in juice for 5-6mins. Grind this with all other ingredients(except cashew, cardamom and ghee/oil) to a thick batter. Do not add water, if required, add extra juice. 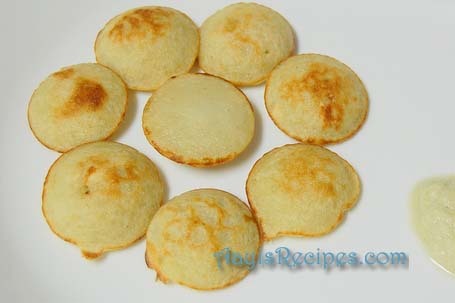 The consistency should be of idli batter. Mix chopped cashews in the batter and make appe immediately. Serve with asafoetida chutney or anything you like. PS: The batter does not need fermentation. If left out long, it becomes sour. So if you want to make the batter in the night and use it next day, keep it refrigerated. Sugarcane juice gets spoiled easily. So keep it refrigerated. If it needs to be used after 1-2 days, then boil it and then refrigerate. waw what a superb recipe. awesome! we dont get sugar cane juice here, but can drool over ur pics. This is something new to me Shilpa. I have only had sugarcane juice before. Sounds pretty good. thanks for the informative post. What a coincidence, i made them last week. We too get fresh sugarcane juice at the Indian stores here. I asked him not to add the spices so make the delicious appe. Paniyaram with sugarcane juice…immm interesting. Tastes well with coconut milk. Looks yummy ! You got Kabbinarasa outside the grocery!How lucky! I remember that juice from Majestic road,B’lore.YUM! Shilpa: Asha, first time I saw kabbin halu, i almost freaked out ;). Now it has become very common. Yeah appe has a taste and smell of kabbu. where do u get that vessel to make paddu. we call it paddu in Kannada or gundpongal in our culture language.. we prepare this in urdal dal,.. nice to know this recipe… what about sugarcane juice where do u get? Shilpa: Sushma, my parents got it from my native Kumta. We bought the aluminum one from Belgaum which also works very well and not as heavy as cast iron one. Read Nupur’s post for more information about the pan. If you want to buy the cast iron version you can follow Indira’s link here. looking at these appes i felt like making them too..but i dont have a appe kayli and also i have not seen sugarcane juice here:(,hey u should have put a snap of your kayli also,you said it is non stick right?? Shilpa, I love these. I got an appe pan when my mom in law was here so we have been making appe often too. And the sweet ones (with or without sugarcane juice) are my fave. PS – I have been going through all your old posts – soooo much to catch up. I think a day has 30 hrs where you stay 😉 Loooooved the father’s day post. I showed it to my hubby too and both of us were drooling over the konkani thali!!! Shilpa: Thanks Ashwini. So good to see you back in action. Shiilpa, its great that u have a grocery whih serves sugarcane juice. Nice recipe. Sugar cane juice in aapam. Brilliant idea. I wonder it can be used in other recipes too. Wd surely try this unique recipe..here v 2 get sugarcane juice,which i love since childhood. I wd revert wt feedback once i make these..tks for sharing! This recipe is tampting I will try it when I go to my So. Cal Home as in No.Calif. most of the Desi stores have all kinds of fresh preparations in San Jose and Fremont area in restaurants or grocery stores. In response to Appe Kayli(COMMENT# 10), real good cast iron Appe Kayali with Aluminum Lid (like a round Dom!with knob) is available for $10 in Chinese and Thai stores. In fact it’s better than Indian Version because each bottom of the round mold is flat and can be placed on Gas or Electric cooking stove in US.In fact my SIL took one from here to India. @K.Boy can u tell me where can i get that appe kayali? Thanks a lot for this recipe,I simply love appe. One question, can I use rice flour instead of grinding the rice grains ? I don’t have a grinder. Shilpa: I don’t think the appe will turn out pluffy if you use rice flour.